Fulbright Foreign Student, Dina Sanioura, at home in the West Bank. “I feel like Fulbright has allowed me to discover my inner self,” Dina Saniora said, reflecting on her journey of self discovery over the past year as a Fulbright Foreign Student grantee from the Palestinian Territories. Wanting to combine both of her passions, science and business, Sanioura originally planned to do a master’s degree in environmental management, but was inspired by William O’Rourke, the executive director of the Beard Institute at Duquesne University in Pittsburgh, to pursue an MBA in sustainability at Duquesne . “He [O’Rourke] was really inspiring and I knew I had to do it,” Sanioura said. The curriculum for the MBA in sustainability is a mixture of classic business coursework with the addition of courses on environmental science and leading change in sustainable enterprises. Over the course of her year studying in the United States, Sanioura’s outlook on Americans and American culture gradually changed in a very positive way. From her experiences living in the student dorms, to calling her professors by their first names, Sanioura found U.S. culture to be a lot more relaxed than she had assumed it would be. The “New Dina,” the Dina who has become both a scientist and a business woman, who actively seeks to engage with creative thinkers, hopes to find a job back home marketing for a pharmaceutical company in the future. She encourages other students in the Palestinian Territories to study hard and to consider opportunities like the Fulbright program for graduate study. “Being chosen for a Fulbright really means a lot. 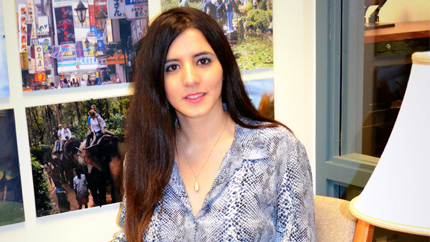 If you work really hard, Fulbright makes you appreciate your accomplishments, it can be your reward,” Sanioura said. The Fulbright Program is sponsored by the U.S. Department of State’s Bureau of Educational and Cultural Affairs. It is the U.S. government’s flagship international exchange program and is supported by the people of the United States and partner countries around the world. AMIDEAST administers the Fulbright Program in the Palestinian Territories.